The first chocolate in the world containing half the calories of normal chocolate. Due to the fact that there is no added sugar and a reduced amount of fat, we manage to reduce the caloric value of dark chocolate by 50% and milk chocolate by 35%*. 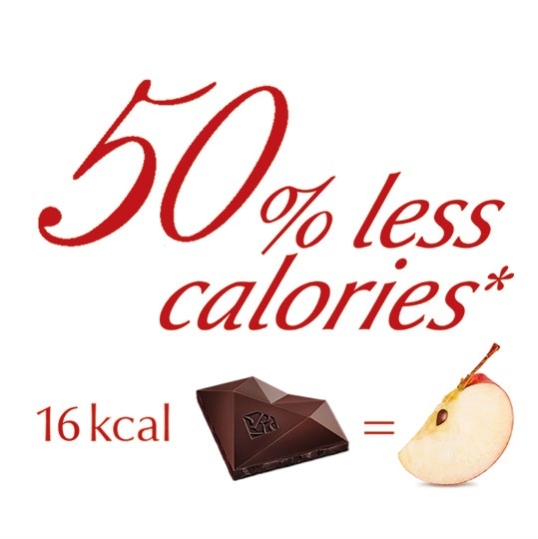 One piece of dark chocolate contains only 16 kcal, which is the same caloric value as a slice of apple! RED Chocolate has no sugar added. It contains only the natural sugar of cacao. To ensure the delicious taste of chocolate we use natural prebiotic inulin; natural zero-calories sweetener: erythritol and stevia which are obtained only from natural products. 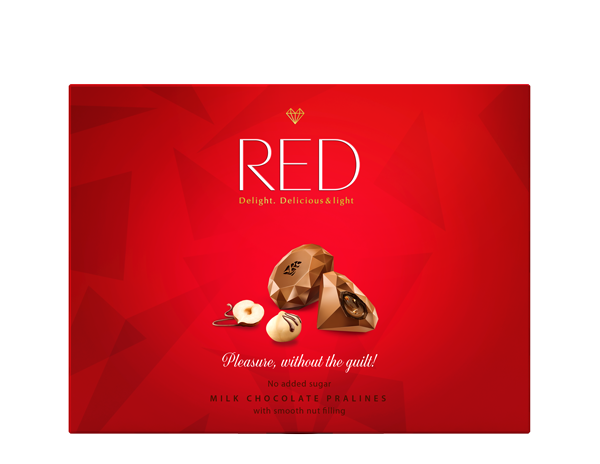 RED Chocolate - the first great-tasting chocolate in the world with so few calories**. Our chocolate has more than 10 invention patents. We use only the best natural ingredients; no substitutes; artificial colorants or preservatives. 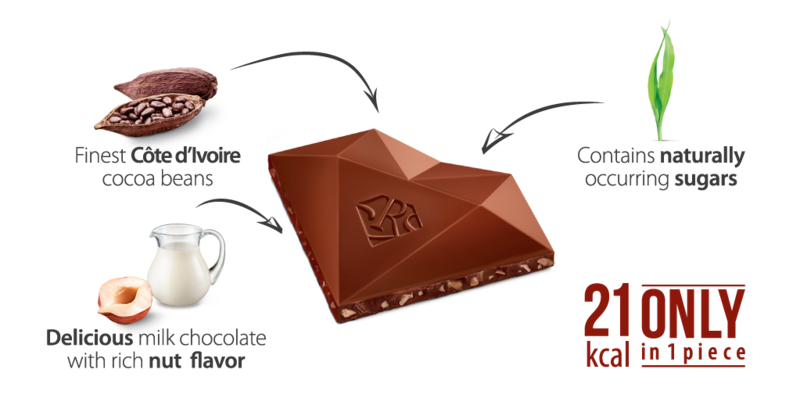 We are also preparing new exciting chocolate varieties that will soon win your hearts! Our consumer is a modern and active person who does not deny him/ herself small pleasures, whilst still taking care of their health and looks. 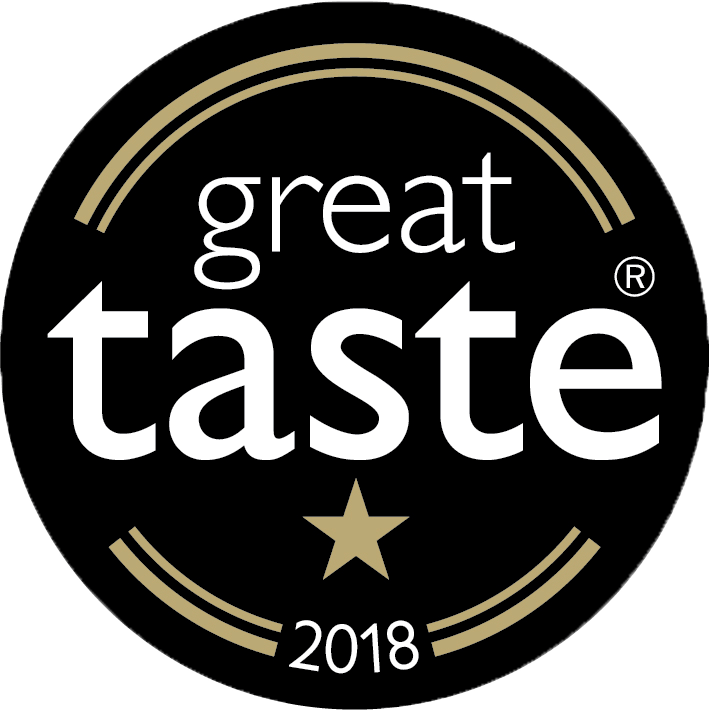 * Red Chocolate has been awarded Great Taste Awards 2018. The quality and safety of our products are guaranteed by the BRC Global Standards. 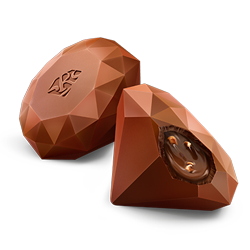 We use an innovative approach at every stage of production – from thorough ingredient selection to having created a unique chocolate tablet shape. Our recipe is based on natural cocoa products; grown in the Ivory Coast (Côte d’Ivoire); erythritol - a natural sweetener also known as "melon sugar"; polydextrose rich in food fibres, plant-sourced and inulin. What is our chocolate made from? 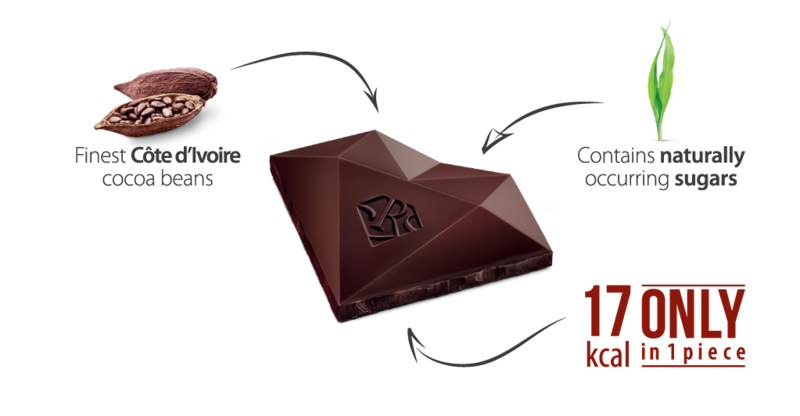 Quality cocoa products are at the heart of Red Chocolate. 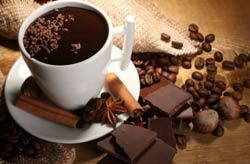 We use cocoa products from the best Ivory Coast suppliers. 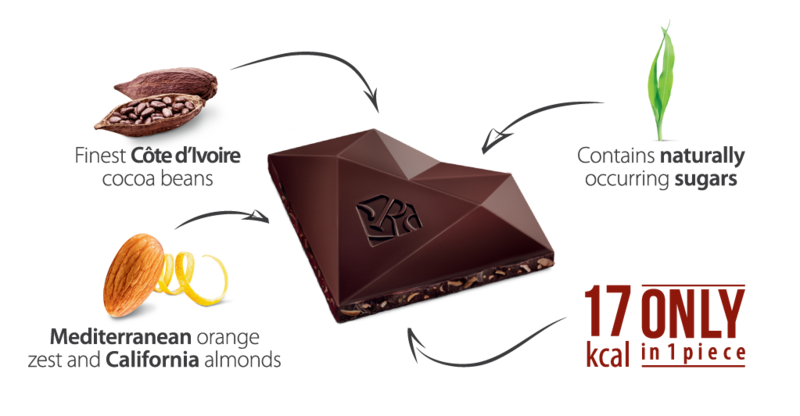 Our Mission is to produce great-tasting chocolate which is also healthy, and we won't compromise on this! 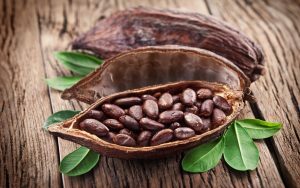 Our suppliers own their own cocoa farms and they maintain the highest standards during the selection, roasting and grinding of the cocoa beans. The goal is to release the most delicate taste and aroma notes whilst ensuring that the final taste is rich and full. Erythritol – a natural zero-calorie sweetener, also known as “melon sugar”. Erythritol naturally occurs in melons, grapes, pears and some other fruits. It is considered to be the safest and most popular sweetener in Europe at the moment. Maltitol – is also present in several fruits and vegetables. It’s caloric value is significantly lower than that of sugar yet it is characterized by a similar full taste and sweetness. Polydextrose – which is rich in food fibers and plant-sourced inulin contributes to healthy digestion. Like our other ingredients, it is made from natural products and allows us to reduce the quantity of fats used in our recipes. It is totally safe and approved for food production in Europe. Inulin – is a natural prebiotic. It normalizes blood sugar levels and activates metabolism and fat burning processes. 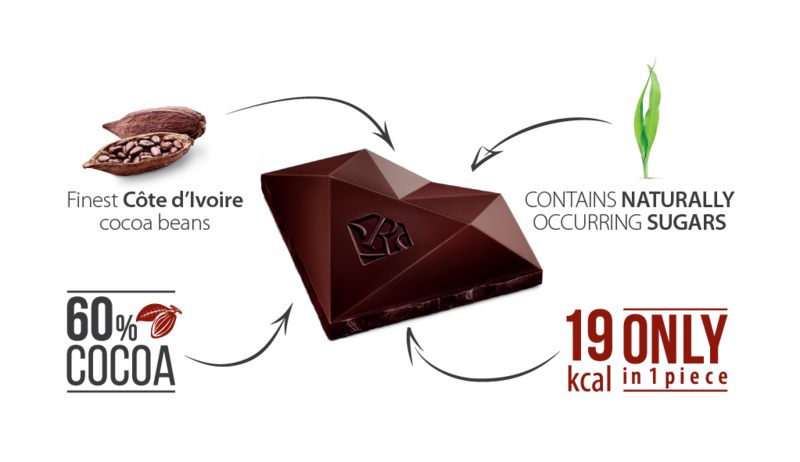 Would you like to become a distributor of RED chocolate? Our recipe is based on natural cocoa products delivered from the Ivory Coast (Côte d’Ivoire), erythritol is a natural sweetener also known as “melon sugar”, polydextrose rich in food fiber, plant-sourced inulin. 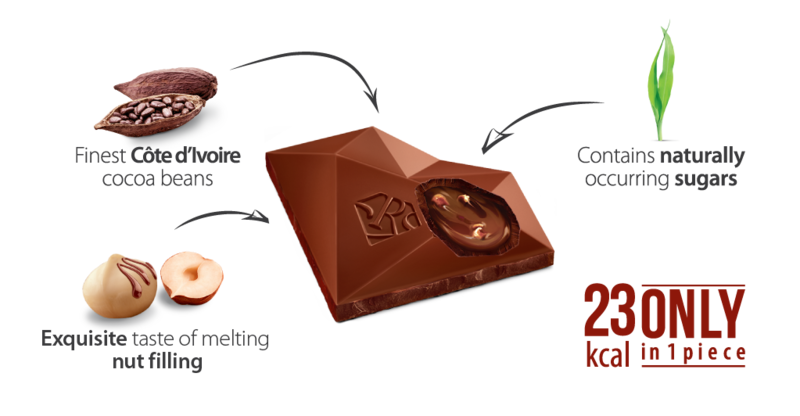 Ingredients: cocoa mass; sweetener (erythritol); bulking agent (polydextrose); cocoa butter; almond pieces 2%; orange zest 1%; emulsifiers: soya lecithin, E476; flavourings; sweetener (steviol glycosides). Cocoa solids 40% min. May contain traces of milk, nuts (incl. peanuts). Our recipe is based on natural cocoa products delivered from Ivory Coast (Côte d’Ivoire), erythritol is a natural sweetener also known as «melon sugar», polydextrose rich in food fiber, plant-sourced inulin. Ingredients: sweeteners: maltitol, erythritol; bulking agent (polydextrose); cocoa butter; cocoa mass; full cream milk powder; skimmed milk powder; hazelnut pieces 2%; milk fat; macadamia pieces 1%; emulsifiers: soya lecithin, E476; flavourings; thickener (carrageenan); sweetener (steviol glycosides). Cocoa solids 25% min. May contain traces of nuts (incl. peanuts). Ingredients: cocoa mass; sweetener (erythritol); bulking agent (polydextrose); cocoa butter; thickener (carrageenan); emulsifiers: soya lecithin, E476; flavouring; sweetener (steviol glycosides). Cocoa solids 40% min. May contain traces of milk, nuts (incl. peanuts). Our recipe is based on natural cocoa products delivered from the Ivory Coast (Côte d’Ivoire), erythritol — a natural sweetener also known as «melon sugar», polydextrose rich in food fibres, plant-sourced inulin. Ingredients: sweeteners: erythritol, maltitol; bulking agent (polydextrose); cocoa butter; cocoa mass; skimmed milk powder; full cream milk powder; vegetable fat (palm fat, emulsifier: soya lecithin); hazelnut paste; nut pieces (hazelnut, macadamia) 1,2%; cocoa powder; milk fat; emulsifiers: soya lecithin, E476; flavourings; sweetener (steviol glycosides). Cocoa solids 25% min. May contain traces of nuts (incl. peanuts). Ingredients: sweeteners: erythritol, maltitol; polydextrose (bulking agent); skimmed milk powder; cocoa butter; cocoa mass; vegetable fat (palm fat, emulsifier: sunflower lecithins); whole milk powder; hazelnut paste; hazelnut pieces 2%; cocoa powder; milk fat; emulsifiers: soya lecithin, E476; macadamia pieces 0,4%; thickener (carrageenan); flavourings; steviol glycosides (sweetener). Cocoa solids 25% min. May contain traces of nuts (incl. peanuts). Ingredients: cocoa mass; sweetener (erythritol); cocoa powder; bulking agent (polydextrose); cocoa butter; thickener (carrageenan); emulsifiers: soya lecithin, E476; flavouring; sweetener (steviol glycosides). Cocoa solids 60% min. May contain traces of milk, nuts (incl. peanuts). Our recipe is based on natural cocoa products delivered from Ivory Coast (Côte d’Ivoire), erythritol - a natural sweetener also known as "melon sugar", polydextrose rich in food fibres, plant-sourced inulin. Energy value per 100 gr. : 1223 kj / 292 kCal. Our recipe is based on natural cocoa products delivered from Ivory Coast (Côte d’Ivoire), erythritol – a natural sweetener also known as “melon sugar”, polydextrose rich in food fibres, plant-sourced inulin. Energy value per 100 gr. : 1604 kj / 382 kCal. Energy value per 100 gr. : 1197 kj / 286 kCal. Energy value per 100 gr. : 1587 kj / 379 kCal. Energy value per 100 gr. : 1629 kj / 389 kCal. Energy value per 100 gr. : 1449 kJ / 346 kcal..